Did you know that in many cultures, a middle name is considered unnecessary? There are millions of people out there who do not have a middle name. But if your baby has a very common first name, it might be a good idea to create a middle name for your child. This helps ensure that they don’t get mixed up with anyone else when they are old enough to apply for a bank account, passport or other items that could potentially put them at risk for identity theft. In this case, you can see a middle name as a way of keeping your child secure. Some people choose to use a middle name in order to honor someone in their family. In some cases, children can be given two middle names, one for each side of the family. You might also choose things that reflect who you want the child to become, such as names that reflect virtues or old-fashioned values. When it’s time to name your little girl, there are many options for creating a name that reflects something beautiful, kind, sweet and precious. Here are a few ways to go with the middle name of your daughter. Flowers are often associated with little girls, as they both considered beautiful and delicate. 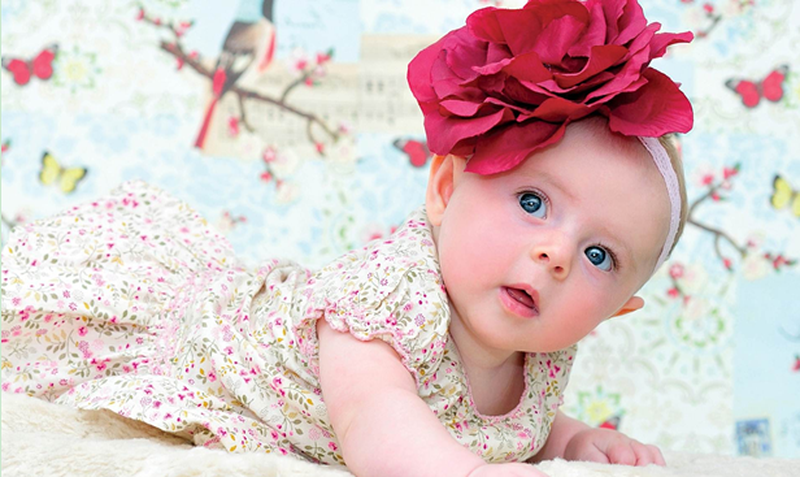 Here are flower names that can show your daughter’s feminine side. The origin of this name comes from the showy flower that is popular in the United States, but is also comes from the Old English, meaning “the day’s eye.” It has become quite popular among those who want their child to have something old-fashioned and trendy at the same time. Meaning “to bloom,” this name tends to depict a showy, happy personality. It became very popular in the 1920s and has since seen a decline, but parents who are looking for something original are starting to pick this one up again. One of the oldest flower names, Rose has been used for many years, either as a first name or as a middle name. As a middle name, it pairs well with almost anything, especially those more traditional names. It is becoming a bit old and tired these days, but several offshoots of the name like Roseanne, Rosetta and Rosa – are still very popular. Becoming a top name in 1973, this middle name has grown in popularity in the years since. It denotes a delicate, deliciously-scented flower that grows in the United States, but the name has spread to other countries as well. In fact, in 2009 it was the most popular name for little girls born in Turkey. Who doesn’t want to have a good, kind, obedient and honest child? These names of virtue can help your child remember their good qualities throughout their life. This is a popular name all across the world. Little girls have been named this for centuries, but it wasn’t until the sixteenth century that it became wildly popular. Look at any family tree and you are likely to find a “Grace” somewhere. For those who think the name is a little too popular, there are numerous variations that can suit your more independent style. This inspirational name might seem like it is rather new, but it has been around for a long time. Many parents choose this as a middle name because it invokes the virtues of honesty, openness and devotion – all things that are wonderful traits you might want any person to have, whether a daughter or a son. A favorite of Puritans, this name has become much more popular in recent years. One of the three theological virtues (the others are Faith and Charity), the name has often been given to little girls to celebrate their possibilities. A very common name that only seems to get more popular as time goes on, this is a very popular name for a female twin. Along with Hope and Charity, this is one of the three theological virtues, which makes gives it an unshakable foundation of goodwill. Many parents choose this name as an indication of their religious convictions. From a time when names were used to portray who the person was inside, this term definitely leads one to believe in a bright, sunny disposition for their child. It came from the phrase “be joyful in the Lord” and has been popular since the late nineteenth century, when a revival of virtue names came to pass. This carries both a virtue and a romantic sentiment. Who doesn’t want to be loved? This always works best as a middle name and tends to go well with trendy, unusual first names for girls. This is a very common name, and for good reason – it sounds great with almost anything. It has been around for centuries, and has been the name of many members of royalty, including a queen. The name means “pledged to God,” originally from the Hebrew language, and offers numerous nickname options for your little girl. A name that has been around since the Tudor times, this one-syllable delight means “God’s gracious gift.” It can be combined with other old-fashioned names to create something more modern, or even something a little trendy, like Mary Jane. This was once a very common name, but now it is considered unusual, which is another stroke in its favor. For over four-hundred years, this held the top spot for the most popular name. One of the most recognizable names from the Bible, Mary means “bitter.” It has been used as a name so many times that almost everyone knows a Mary, and royalty is full of the name in each generation. Meaning “pure” from the Greek, this name has become much more popular lately, thanks to the lovely Duchess Kate. There are numerous nicknames for this, and it also blends well with most other traditional names, making it a natural choice for parents who want to give their child something old-fashioned and trendy at the same time. From the Hebrew meaning “compassionate friend,” Ruth is a name that became very popular for many years, especially among followers of the Bible. The biblical Ruth was dedicated and devoted, which is something that everyone wants their little girl to become when she grows up. Not happy with any of the above? Here are other middle names for girls that might get your attention and keep your child happy throughout their lifetime. Somebody necessarily lend a hand to make critically articles I'd state. That is the first time I frequented your website page and up to now? I amazed with the research you made to create this particular publish amazing. Fantastic task!